Shortly after she won a seat in the U.S. Senate in 2016, Kamala Harris said she expected to follow the traditional freshman lawmaker playbook: ?Listen and watch, and kind of get a lay of the land.? Far from keeping her head down, however, California?s junior senator has put herself way out front. She?s embraced a high-profile role in confronting the Trump administration, from her sharp questioning of Cabinet officials in public hearings to fiery speeches on the National Mall. In January she?s releasing a book about her political vision. And for someone who doesn?t have to be on the ballot again until 2022, Harris is devoting a lot of money to building a national profile. Her Senate campaign spent $4 million in the past year and a half, including $1.6 million to Revolution Messaging, the consulting firm that built Sen. Bernie Sanders? widely praised digital and branding strategy. Harris won?t say whether she?s running for the 2020 Democratic presidential nomination. But nearly everyone thinks she will. Her first ? and perhaps greatest ? challenge is introducing herself to American voters outside of California who know little about the 53-year-old beyond early comparisons to President Barack Obama. And Harris needs to move fast. Her political rivals ? in the GOP and within her own party ? are already trying to put their own, less flattering stamp on Harris. The branding effort portrays her as a Beltway outsider, a progressive with a compelling personal story and a tough former prosecutor who won?t shy from President Donald Trump?s attacks. When the White House tweeted its first-ever personal attack against Harris last month, saying her criticism of Trump?s border policies equated to supporting criminal gangs, Harris wasted no time snapping back, accusing the president of ?ripping babies from their mothers,? a reference to his immigrant family separation policy. ?A strong, accomplished African-American woman is in many ways the thing that keeps the president up at night,? said former Hillary Clinton campaign spokesman Jesse Ferguson. ?It is a bit of his nightmare.? So far Trump hasn?t given Harris a demeaning Twitter nickname, as he has for other possible Democratic 2020 contenders like Sen. Elizabeth Warren, D-Mass., and former Vice President Joe Biden. In fact, Trump hasn?t mentioned Harris at all from his personal Twitter account. But it?s only a matter of time. ?You can bet the Trump campaign ? will pour an enormous amount of resources into defining her,? said former Ted Cruz presidential campaign spokesman Ron Nehring. This isn?t exactly the kind of first term Harris was expecting. A Hillary Clinton victory in 2016 was supposed to give the former California attorney general eight years to craft a legislative record in the Senate, forge alliances and prepare for a White House bid. But Trump?s surprise win fast-tracked Harris? political calculations. She declined to be interviewed by the Los Angeles Times for this article. 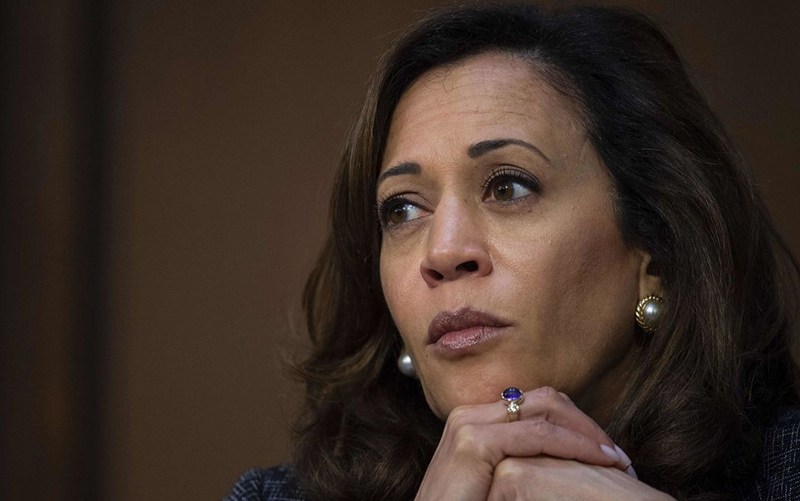 Compared to the more cautious style she displayed as California?s top law enforcement officer and during her tightly controlled 2016 Senate campaign, Harris these days seems more at ease in her own skin, impassioned and unapologetically liberal. She?s warmed to speaking to crowds. Her belly laugh is booming and she?s quick to touch people on the shoulder or arm. She?s mobbed after every speaking event, and despite staff and reporters trying to gain her attention, the senator usually insists on speaking with nearly everyone who approaches her. ?Whenever she enters a room, all heads turn,? said Claremont McKenna College politics professor John J. Pitney, who is also a former state Republican leader. ?It?s the same kind of quality that Reagan had and Bill Clinton and a few others have, and she?s got it.? Daughter of a Jamaican immigrant father and an Indian immigrant mother, she speaks often of her ?stroller?s eye view? of the civil rights movement as a child in Berkeley, and how her parents? activism inspired her to work for change from inside the political system. In recent months she?s focused on female voters ? in a lengthy article in Vogue, an opinion piece on net neutrality in Cosmopolitan magazine and the obligatory dance-off with talk show host Ellen DeGeneres, who lobbed softball questions like who was her childhood crush. (It was the Jackson Five?s Tito.) In Oprah Winfrey-esque style, Harris this year began calling on liberals to channel their frustration with Trump into becoming ?joyful warriors.? ?She is able to blend a real progressive agenda and an exciting profile and a strong presence together in a way that is catching attention,? Ferguson said. Princeton University history professor Julian Zelizer calls Harris ?a fresh voice.? At the same time, Harris? rivals ? including Republicans and some within Sanders? wing of the Democratic Party ? are striving to define the senator for their own purposes. Perhaps nothing better encapsulates the battle to define Harris than her dogged, rapid-fire questioning of Trump administration officials during Senate hearings. Clips of the former prosecutor coolly facing down Attorney General Jeff Sessions, then-Homeland Security Secretary John F. Kelly, Deputy Attorney General Rod Rosenstein and others have become hits on YouTube, circulated by her supporters and detractors. ?Let me finish once,? a frustrated Kelly, now the White House chief of staff, said during one hearing as she peppered him with questions. ?Excuse me,? Harris replied. ?I?m asking the questions.? Her relentless examination of Sessions left the former Alabama senator visibly shaken. ?I am not able to be rushed this fast. It makes me nervous,? he said. The left crowed at the image of a black woman asking tough, detailed questions and demanding straight answers. Her appearances have not only helped introduce Harris to a national audience, they?ve underscored the image she is cultivating as assertive and unflappable. ?She has broken through into one of the highest and most powerful white men?s club in the world,? said Debbie Walsh, director of Rutgers University?s Center for American Women and Politics. But Harris? detractors have used the same hearings to portray her as a bully. Her questioning at hearings has been frequently interrupted by white, male GOP colleagues, who complain that she is badgering Trump officials or refusing to let them answer. Her response to being admonished by one GOP committee chairman for her lack of ?courtesy? ? raising her eyebrows and blinking in disbelief ? became a wildly popular GIF. On the internet, Trump supporters have used such episodes to attack Harris in ugly, often sexist or racist terms. Former Trump campaign adviser Jason Miller said on CNN that Harris? grilling of Sessions was ?hysterical.? Such attacks can backfire. Many women quickly criticized Miller?s loaded language in describing Harris? questioning, which they said was not much different from that of her male Democratic colleagues. ?A lot of the gendered stereotypes and the gendered assumptions will still exist for the women in 2020,? Walsh said. ?It is such a double standard.? Harris? time as a prosecutor and as California attorney general is another defining part of her narrative and potential appeal to independent and moderate voters. She references the experience in nearly every speech and has become a leading voice in the Senate on criminal justice reform. ?If I were writing speeches for her I would write speeches emphasizing all the crooks she put in jail,? Pitney said. ?That appeals to everyone. That is one topic she has some credibility on.? ?What is the likelihood that that will wind up on a TV spot in Iowa, Michigan and Wisconsin? I would say probably say 100 percent,? Nehring said. ?That fits very well into a narrative that she is a left-wing coastal elitist.? Some Sanders? supporters never forgave Harris for her early endorsement of Clinton in the 2016 primary, or for the Clinton donors and supporters who have rallied around her since. They argue she?s too ?establishment.? Some, hoping to clear the way for Sanders to make another run, have launched a Twitter hashtag #NeverKamala, casting her as too corporate and too beholden to Wall Street. They point to her decision against prosecuting OneWest Bank, then led by Steven Mnuchin, for alleged foreclosure violations in 2013, and acceptance later of a $2,000 campaign contribution from Mnuchin. She later voted against his confirmation as Trump?s Treasury secretary. Harris has worked hard since joining the Senate to bolster her progressive credentials. She has co-sponsored tuition-free college legislation and was the first senator to sign onto Sanders? Medicare for All bill. In February, she was one of three Democrats to vote against a bipartisan bill to help immigrants brought to the country illegally when they were children because she thought the measure went too far in providing money for a border wall. Earlier this year she announced she would no longer accept donations from corporations.